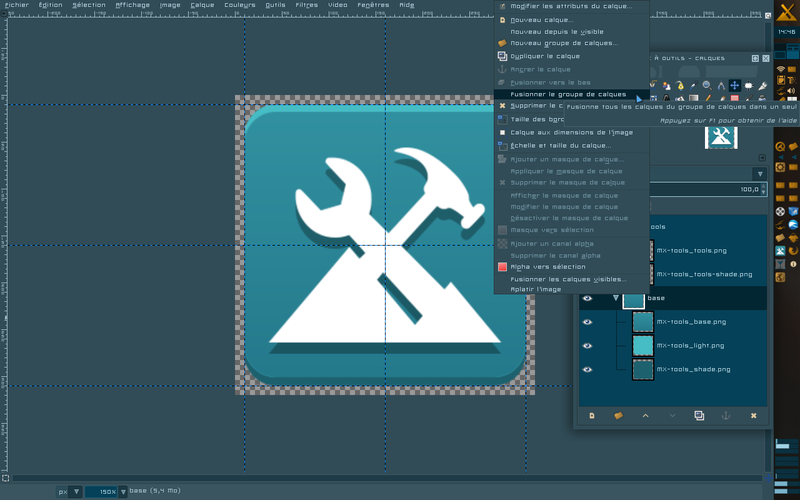 [GIMP XCF] MX Tools icon : customize your own ! Attached to this post and archived in tar, you'll find a multilayer XCF, extracted from a SVG created by 2 other forum members. Since it has been extracted from a vectorial & multilayers SVG, it's very precise with a very good resolution (no pixelsaw ^^) its curves are soft like velvet (i may have felt in love with an icon). As i use to, i've expansed its size to 320x320 px @ 150 dpi so it can be easily manipulated. 1/ right-click the group of layers named "base"
1/ right-click the layer named "mx-tools_base.png" and select "Merge down"
Last edited by k_sz on Tue Mar 13, 2018 1:21 pm, edited 1 time in total. Re: [GIMP XCF] MX Tools icon : customize your own ! As for who the 2 forum members are, I think Ghost67 did the SVG from Antech's original PNG graphics. Later on, I think SwampRabbit created a version of the teal PNG icon of MX-Tools with deeper curved corners to match the Moka set of icons. This has not been used yet. Much appreciation to them as well.